Considering Wisdom Teeth Removal in Perth? If you are considering wisdom teeth removal in Perth, the team at Woodvale Park Dental is here to offer it in a compassionate and caring way. We know that having teeth removed can be an overwhelming and frightening experience to some people. We can ensure that you will be well taken care of when getting your wisdom teeth removed and we will do our best to maximise your comfort and ensure that you feel your best throughout the entire process. We have many years of experience in wisdom teeth removal and you can feel confident that you are in trusting hands. If you are like most people, you probably have a bit of trepidation about going through wisdom teeth removal in Perth. As with any dental procedure, your dentist will want to initially conduct a thorough examination of the wisdom and surrounding teeth. Panoramic or digital x-rays will be taken in order for your dentist to evaluate the position of the wisdom teeth and determine if a current problem exists, or the likelihood of any potential future problems. The x-rays can also expose additional risk factors, such as deterioration or decay of nearby teeth. Early evaluation and treatment (typically in the mid-teen years) is recommended in order to identify potential problems and to improve the results for patients requiring wisdom teeth extractions. Only after a thorough examination can your dentist provide you with the best options for your particular case. Wisdom teeth removal is a common procedure, generally performed under local anesthesia, anxiolysis, intravenous (IV) sedation or general anesthesia by a specially trained dentist in an office surgery suite. The surgery does not require an overnight stay, and you will be released with post-operative instructions and medication (if necessary), to help manage any swelling or discomfort. 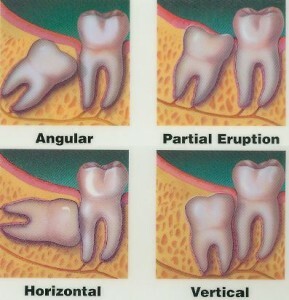 We are here for you if you have any questions about wisdom teeth removal in Perth. We want to assist you in any way we can and ensure that you are as comfortable as possible during the procedure usually assisted by Anxiolysis medication. You should feel nothing during the actual procedure and may feel mild pain afterwards. Over the counter pain medication is typically all that is needed to ease discomfort.